A few new developments - all in the software. I discovered a way to annotate the image with information without doing it across the image. The four corners can be used for that purpose. I've also overlayed a dark blue background, and brown border to the lens. I've also taken off extraneous light from the camera itself, and sources of light pollution by subtracting a 'dark frame'. This is all done using a image library for Python. Last edited by Aratus on Fri Jun 15, 2018 10:55 pm, edited 2 times in total. Further developments. The camera has been replaced by an earlier PiCamera 'modded' with a proper all-sky lens. 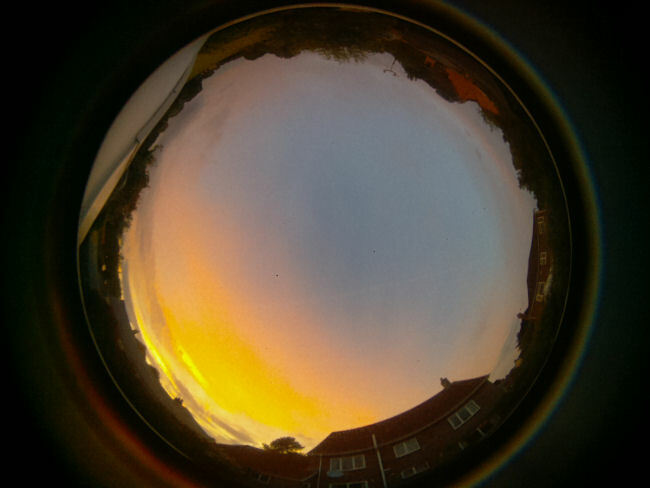 (modmypi) The camera unit has now been elevated above the observatory dome, and due to some forestry work to my west, I can now see the sunset! 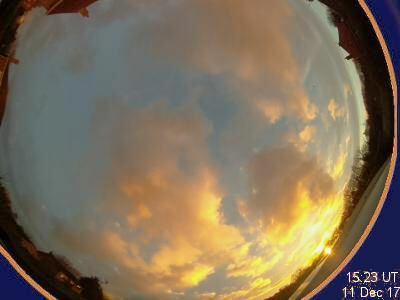 The camera continues to be useful in monitoring the skies. The only problem now is that it takes a step ladder to bring it down, and wiping/cleaning the transparent dome is a major operation. Tip-toes with a paper towel no longer does it. Last edited by Aratus on Fri Jun 15, 2018 11:04 pm, edited 1 time in total. Thank you. For me it is great help, and well worth the effort in making it work. I can monitor when the sky clears from inside the house, and get outside at the first opportunity. It beats having to get up, go outside and check the sky every so often. This way I can see tell the very moment the cloud has cleared from the comfort of a desk or even my armchair. We get precious little clear sky time, and this way I can maximise every minute. While I'm in the observatory I can see little of the sky, and this camera warns me when cloud is approaching. For instance, it enables me to decide if it is worth doing a long series of exposures, or not. If it does cloud over, I can go inside and check what happens next while I do something else. It beats standing outside in the cold waiting for the cloud to clear. As an added bonus it will record a bright meteor or bright satellite/ ISS passing over. Also various atmospheric phenomena like sun arcs, moon arcs/rings, alpen-glow and good old rainbows and even lightening. There is also the satisfaction of constructing something yourself, and learning new skills. The software now automatically works out whether the sun has set or not and changes the parameters of the camera accordingly. So the camera now operates fully automatically. Next, the 'light shield' is now incorporated into the camera unit, meaning the housing can come straight off without any wires or anything getting in the way. The other improvement is a fan to cool the Raspberry Pi down in hot weather. That transparent dome acts as a bit of a greenhouse. 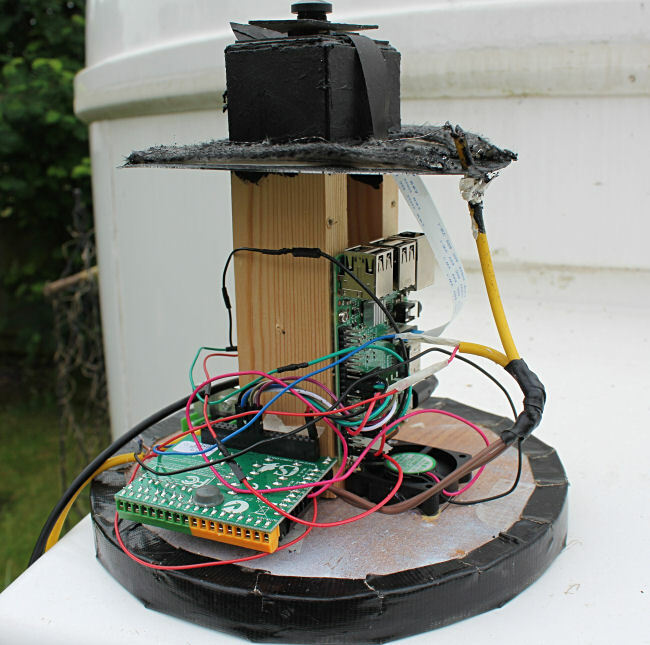 The fan is automatically controlled by the Raspberry Pi using a spare relay on the 'piface'. Another development is that the software now takes full size photos (1200 x 900) of the sky at dawn and dusk, and copies them. It should be interesting to compare them throughout the year. I really like this project idea and how you have documented it with these posts. It's great! I was thinking about creating something similar myself, do you have a website that collates the build that you have done, with equipment and software used? I'm a software engineer, so it should help if coding is required. I haven't got a web site or anything that describes building an All Sky Camera from scratch. As you can see , it is mostly from bits of scrap. Using a Raspberry Pi and a PiCamera does have its limitations, but I've recently used image manipulation in Python to add 5 images together which brings out all the 1st magnitude stars. The temperature in the transparent plastic dome is measured by the simple DS18B20 Temperature Sensor. To provide control of the heating element (to stop dew formation), and to give the poor enclosed Raspberry Pi some cooling with a fan, I use the PiFace https://www.modmypi.com/raspberry-pi/relays-and-home-automation-1032/relay-boards-1033/piface-digital-2-io-expansion-board-model-b-plus There are other boards with relays which would do just as well. Eventually I fed a 12v supply to the housing, and used a cheap car USB socket which gives out 5v for the Raspberry Pi, and 12v for the fan and heater. The latest Raspberry Pi 3 uses a little bit too much power for the USB socket, so I use an old Raspberry Pi 2. Another alternative is to use a Raspberry Pi Zero, which as well as using less power is cheaper and smaller. The images it produces are kept on the Pi memory and read by a PC on the same wifi network. The housing is an inverted plastic paint container. The dome is a cheap one used for an underwater camera. If you would like to build something similar then start with getting the Raspberry Pi (zero?) and the camera, and learn to take photos using python. Then you can build it into a container fitting the temperature probe, heater and fan. You need some kind of relay board for the fan and heater, but the probe connects straight to the Pi. Some nichrome wire on a piece of oven seal cloth for the heater. If you have any questions, don't hesitate to ask. Your questions and my answers will help others who want to give it a go. The chances are that you could come up with different or better solutions than me. Sorry, I assumed I'd be emailed if you replied, and never got an email. I've only just remembered to check back now. Thanks for your advice. It's something I'm keenly interested in, but I have the feeling I'll struggle to find/make the time to get it off the ground. I might put the Pi and a camera on my christmas list though, to help prompt me to play around with them. Ideally I'd like to find a camera that gives a good field of view, and shows almost what the eyes see at night, live, but I'm not sure we're quite there technically with that yet? If we are it'd probably be expensive. I'll check back here in a while if I get a project started! How much time do you think you've put into it? What's your background? It is a project that's evolved, as you can see from the thread. If you have all the bits, then putting it together will take a couple of hours. Raspberry Pi cameras are basically the sort of camera you might get in one of these modern 'smart phones'. They are not astronomical cameras. This one https://www.modmypi.com/raspberry-pi/camera/camera-boards/raspberry-pi-camera-board-fisheye-222%C2%B0-lens-5mp works easily with the raspberry pi giving video or stills of the whole sky. However, it will show only 1st and 2nd magnitude stars. It needs some programming too. That is enough for my initial purpose which is to see if the sky has cleared while I am in the house, and to see any cloud coming and going while I'm in the observatory. 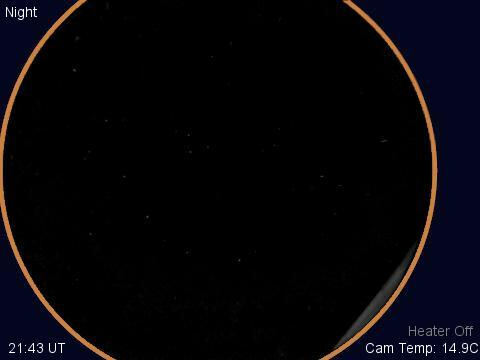 Using an astronomical camera (like a ZWO) works well with a PC. Using a 30 second exposure will give a view very much like what can be seen with the eye. However, that means tying up an expensive PC for a specific task. Since you last posted there has been a bit of a development, in that ZWO have come up with a raspberry pi that that work with their cameras. It has the advantage that it has its own software, but it isn't specifically designed for an all-sky camera. I have been looking at it and I think it has possibilities - not least because it suggests that with the right drivers it is possible to run an astronomical camera with a Pi without a lot of fuss. The unit with all its accessories can be found here. It isn't cheap though, and at the moment I don't know exactly how it can be used as an all-sky camera. It seems to operate via wifi and a tablet/phone, which I'm unfamilair with. I don't generally enter into private correspondence because I want to share information with everyone who reads the forum threads. I'm more than happy to help you or anyone else reading this to set up an all-sky camera. If using a raspberry pi, I can at least give some pointers as to how it works, and the fundemental ideas on how to program it in Python. It needs to be done on the forum, so it can help many others too. I'm just someone who has just learnt it all as I go along - and still learning. Aratus wrote: I haven't got a web site or anything that describes building an All Sky Camera from scratch. As you can see , it is mostly from bits of scrap. Using a Raspberry Pi and a PiCamera does have its limitations, but I've recently used image manipulation in Python to add 5 images together which brings out all the 1st magnitude stars. You can always write a guide and make it available on Kindle.